It's the Fiac in Paris at the moment, a very important modern art fair that takes place every year around the same period. The cool thing is that in addition to the actual fair that takes place at Le Grand Palais, they also have lots of art happenings around Paris. Including inside the Tuileries gardens where I took this photo yesterday. 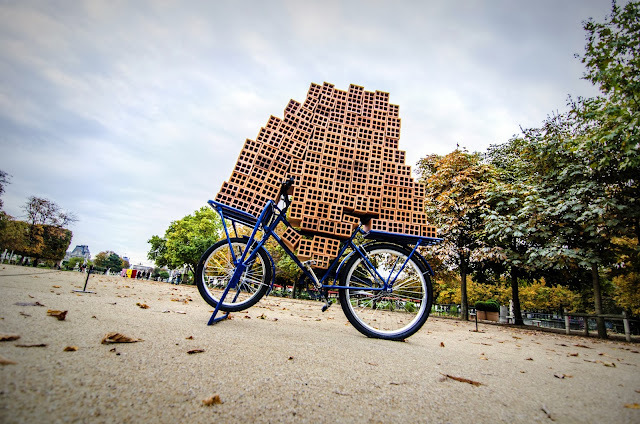 The piece of art is by Hector Zamora, a Brazilian artist and it's called, well, simply bricks on a metal bicycle! This picture and its surrounding give it a third world look. Looking at it, you would never think of a location like Paris. Very well done Eric. Have a nice weekend! Furieusement artistique ! I feel lucky to see this piece of art from Zamora, on PDP ! It is a beautiful input . The title could have been : bricks in a garden ! Very well done. I love all the metaphors a picture like this one can make think about.